Part of the deck is at a 45 degree angle to the Cottage. This means that the deck joists will be at a 45 degree angle to the ledger board. hence standard joist hangers, at 90 degrees, just won't work. 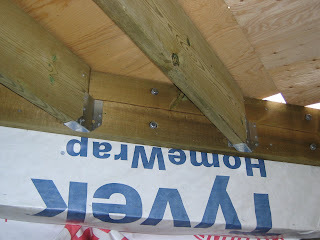 The solution is to use joist hangers that have a 45 degree angle. The picture illustrates the ones that we used. These were actually made of heavier material than the standard 90 degree ones. You probably have noticed that these hangers seem a bit smaller - and they are. Technically the 45 degree hangers I used are for 6- and 8-inch joists, so I shouldn't be using them solely to hold the 2x10 joists. To strengthen the joint I added three 3.5-inch framing nails above the joist hangers. The material on the deck is temporary decking of plywood so that we could use the deck to access the main floor walls, assemble the gazebo trusses and install the tyvek.